Creamy and elegant, these dark chocolate truffles have a soft, melt-in-your-mouth filling and a rich chocolate coating. 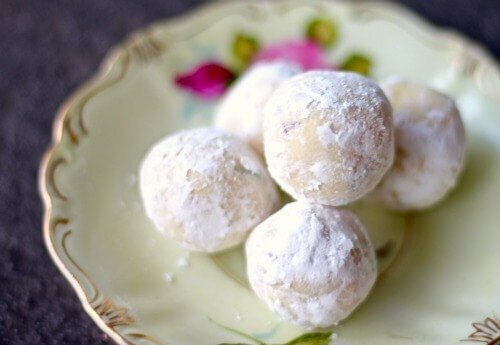 Beautiful enough to give as gifts or serve to guests, this truffle recipe is unbelievably easy, too! Post updated September 2018 from the original 2016 version. Dark chocolate truffles are elegant, there’s no way around it. When I see them I think of fancy chocolate shops, special occasions, and Paris. They are the macarons of the candy world but the funny thing is homemade chocolate truffles are super easy to make. In fact, they’re just as good (or better) than the ones you can buy at the chocolatier. It’s the funniest thing — I don’t think I bought one chocolate truffle while we were in France. I ate all kinds of other things but for some reason truffles weren’t on my mind. Ah well, I guess I’ll have to go back! I first learned to make chocolate truffles early in my first marriage. We didn’t have much money and I had to come up with homemade gifts that family members and friends would actually like. 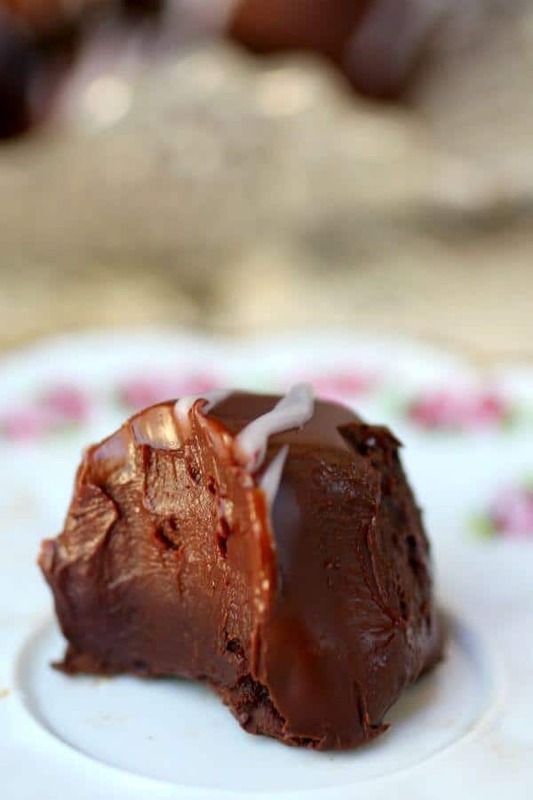 I had a cookbook that happened to have a ganache recipe in it and there were instructions for rolling the ganache into balls and then covering the balls with cocoa. Over the years I experimented with different coatings and flavors. Sometimes I tried adding other ingredients like crushed toffee. I learned what worked and what didn’t. I also figured out pretty quickly that my family and friends really liked chocolate! My dad especially did. His appetite for all things chocolate (except pudding and pie) was legendary. My two oldest kids used to make him a chocolate basket for Christmas every year. It was huge and filled with all kinds of homemade chocolate from brownies to truffles. My dad loved it and looked forward to it every year. The Christmas after he passed away the kids made a chocolate basket in memory of him and we devoured it. There was some laughter and some tears as you can imagine. Still, what better than chocolate to celebrate someone’s life and ease the pain of missing them? And by the way… yes, these dark chocolate truffles are literally easy enough for kids to make by themselves with a little supervision. The one thing to remember about making dark chocolate truffles is that you’ll need really high quality chocolate. There are just a few ingredients so you have to make them count! Get the best chocolate you can. Some brands to look for are Valhrona, Scharffen Berger, or Callebaut. They are more expensive than Nestle or Hershey but the difference in flavor is massive. Try to use a chocolate with at least 60% cocoa solids. BUT don’t let the lack of high end chocolate stop you. If you can’t afford the premium brands go for what you can afford and have access to. Let’s face it, it’s chocolate. How bad can it be? You can freeze these dark chocolate truffles in a food grade plastic container with waxed paper between each layer of candy. They’ll last a long, long time and it’s nice to be able to pull a couple out of the freezer to serve with coffee. Make sure everything is very dry. Even a drop or two of water will cause the chocolate to seize up and be grainy. If that happens you’ll just need to throw it out and start over. When you’re stirring the chocolate into the cream be careful not to stir air into the mixture. Too much air will make it fluffy instead of the creamy texture you’re looking for. Scharffen Berger, Valhrona, or Callebaut are the best chocolates that I’ve found for truffle making but I’m not adverse to using Ghirardelli when the budget is tight. If you’re going to dip your truffles in a chocolate coating then these dipping tools make it SO much easier (and less messy). 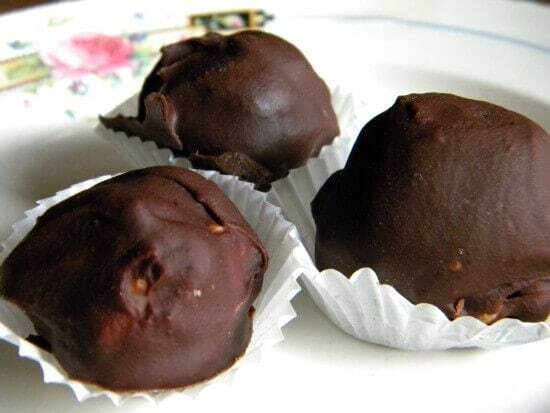 Here’s that homemade truffles recipe. It’s classically rich and creamy. If you are making a collection of truffles as a gift try these peanut butter pretzel truffles as well – perfect for those who love sweet and salty! Love this recipe? Please give it 5 stars! 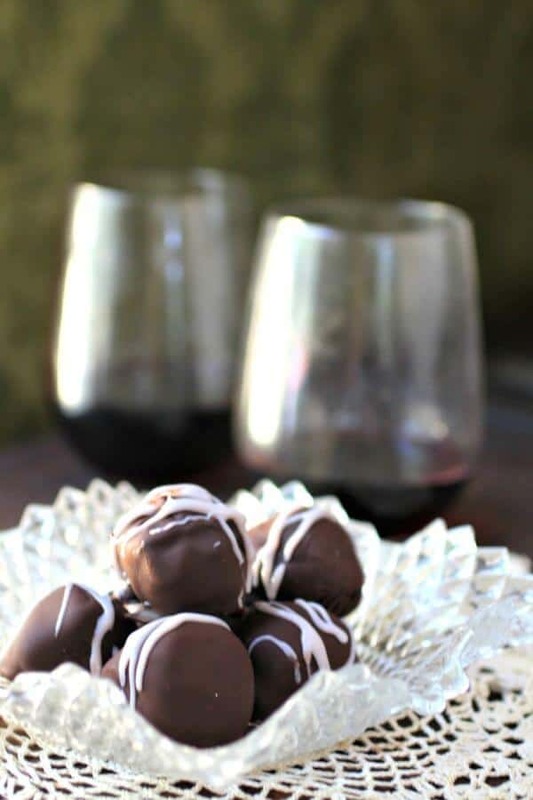 Creamy and elegant these easy dark chocolate truffles make perfect gifts. Add them on a saucer next to your after dinner coffee or just savor one to stave off the blues. They are a burst of dark chocolate flavor. Cut the butter into squares and set aside. Bring the cream just under a boil – bubbles will form around the sides of the pan. Carefully stir the mixture until smooth. Stir until smooth and well mixed. Refrigerate until cold and firm, about 1 hour. Form the mixture into tablespoon sized balls. Place the balls in the freezer for about 10 minutes. Dip in the melted coating and drizzle with the white chocolate. Add the chocolate and the vegetable shortening to a microwave safe bowl. Melt on 50% power for 2 minutes, stirring every 30 seconds. (you may not need the whole 2 minutes. Melt the white chocolate and shortening as above. Oh I did, Jenna! Thanks! 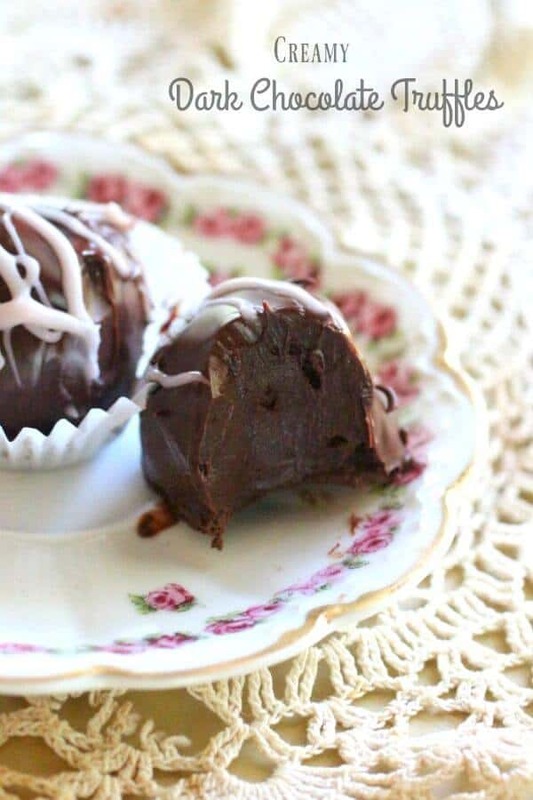 Oh my goodness Marye – these truffles look sinfully delicious! Thanks for all the great tips and which kinds of chocolate to buy. Great tutorial! They are my favorite basic truffle! 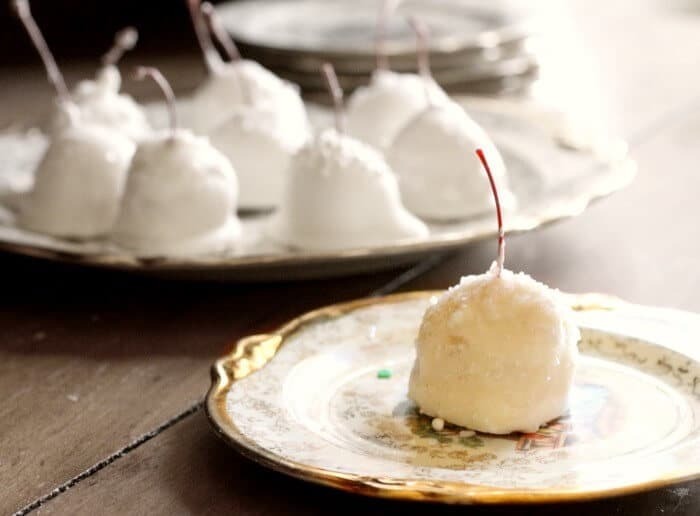 I’m pretty sure I would eat way to many of these yummy truffles if they were in front of me right now! Yum!